These elegant earrings hold "pebbles" of frosty sea glass which have been shaped and smoothed by the ocean. These elegant earrings are built around "pebbles" of sea glass--discarded glass that is shattered, shaped and smoothed by the ocean before washing up on the beaches of Hawaii, where Gillen seeks it out and collects it. The rounded, organic shapes are framed in handcrafted sterling silver. The reflective silver makes the translucent glass catch the light, almost glowing from within. A beautiful collaboration of human ingenuity and forces of nature, each piece has unique variations in shape and color. Handmade in the USA. 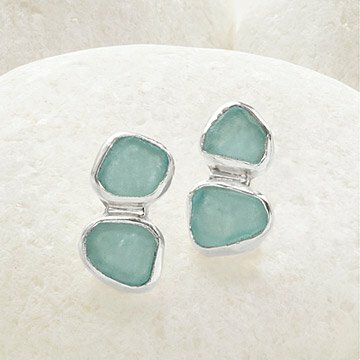 Clean silver with a soft polishing cloth, the sea glass can be cleaned with a small brush using soap and water. Due to the handmade nature of these items, each stone size, shape, and color may vary slightly from photo. I'm all about unique and these earrings bring back memories of hunting for sea glass in Hawaii. Matches the b ace let I also bought from here. Colors were a beautiful green and soft blue. They match a stunning sea glass necklace I have. These earrings are sublime; depending on the light, they either catch and hold it or they appear almost clear and translucent. The silver is just enough to frame the glass without overpowering it. Product does not look as the one on the website at all. Very small compared to the picture online. Fragile. Won't recommend it. Love these; just the right size as I do not wear long earrings. Would like to see you feature more of Ms. Gillen's work.